Officers from Northumbria Police will star in Car Wars. Picture by ITV. Officers from Northumbria Police will feature on TV when a new access-all-areas documentary hits the screens next week. Earlier this year film crews spent three months with the force’s Operations Department to film a three-part series called Car Wars. It will follow the work of Northumbria Police’s motor patrols officers as they look to cut car crime from the streets of the region’s cities to the twisting lanes of rural communities. Cameras will go into detail with officers who are forensics experts as they look to piece together the tiny details of what has caused a collision. They will follow the force’s Operation Dragoon team as they use their detective skills to target the most dangerous car criminals in the North East. And the public will also see some of the Dog Section in action as they look to sniff out those offenders looking to avoid the long arm of the law. Assistant Chief Constable Darren Best will be watching when the programme airs on Tuesday evening and he said the show is an opportunity for people to get to know the people behind the uniform. He said: “This is a really great way for us to showcase the work we do here in Northumbria and seeing our officers in such a high quality programme will fill everyone in the force with great pride. “We have just started a recruitment process that will see 600 new police officers join over the next three years and this gives the public an opportunity to see the difference they can make. “Our officers do an incredibly difficult job and some of the incidents that happen on our roads can be some of the most complex investigations we have to undertake. “I will be tuning in on Tuesday evening and it will be a very proud moment for me when I see Northumbria Police officers doing exactly what they do best – protecting the people of the North East. Sergeant Julie Neve, of Northumbria’s Dog Section, features heavily in the documentary alongside her German Shepherd Bruce and her Cocker Spaniel Cracker. She said: “This programme is going to give the public a chance to see how hard our officers work every single day to try to keep the people of Northumbria safe. “There has been a lot of attention on our adorable police puppies in recent weeks but this will give the public a chance to see our working dogs in action. “The public will also meet our Operation Dragoon team and see just how much work goes into bringing charges against individuals who commit crime on our roads. The first episode of Car Wars will air on ITV at 9pm on Tuesday, with two more episodes showing at the same time on September 20 and September 27. 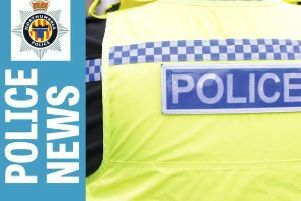 Northumbria Police is recruiting more than 600 police officers over the next three years with 200 different roles available including those seen in the programme. Members of the public can apply to become a police officer right now by visiting the website and filling in the online application form.